TOM JACKSON & RANDY GRADISHAR DUAL SIGNED BRONCOS 16x20 PHOTO. 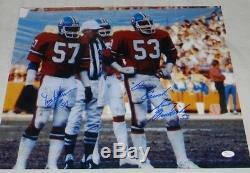 Tom Jackson and Randy Gradishar, former All-Pro linebackers for the Broncos, have each autographed this 16x20 photo. Randy included the inscription "Orange Crush" with his signature. Certificate of Authenticity This item comes with a certificate of authenticity (COA) from JSA - James Spence Authentication and was signed in the presence of one of their representatives. You will receive a serial numbered COA along with a matching serial numbered sticker on the photo. The authenticity can be verified online by entering the serial number. Collegiate Authentics is committed to your complete satisfaction. Collegiate Authentics takes authenticity very seriously. We understand how important it is for you to know that the item you are purchasing is 100% authentic. That's why we guarantee the authenticity of every item we sell and will always provide a certificate of authenticity with every item. The signed items we sell come exclusively from paid athlete appearances and signings in which we have participated, and from only the top, most reputable suppliers in the business, including Steiner Sports, Schwartz Sports, Mounted Memories, Tri-Star Productions, and UDA (Upper Deck Authenticated). The item "RANDY GRADISHAR TOM JACKSON SIGNED DENVER BRONCOS ORANGE CRUSH 16x20 PHOTO JSA" is in sale since Saturday, August 1, 2015. 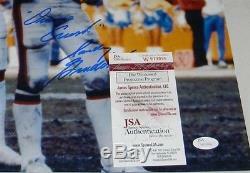 This item is in the category "Sports Mem, Cards & Fan Shop\Autographs-Original\Football-NFL\Photos". The seller is "college_authentics" and is located in Allen, Texas. This item can be shipped to United States.